HÀ NỘI — Xuân Trường Construction Company has bought a 5.5kg meteorite at an auction held in Boston recently. The company has confirmed with local media that the meteorite will be transferred to be exhibited at Tam Chúc Tourism Site in the northern province of Hà Nam. The company bought “The Moon Puzzle” for US$612,500 on October 19. Most lunar meteorites found are the size of a walnut or golf ball, said Notkin, who is CEO of Aerolite Meteorites, which sold the rock. The RR Auction said it’s one of the biggest pieces of the moon ever put up for sale at the online auction that ran from October 11 until October 18. The lunar rock was found last year in a remote area of Mauritania in northwest Africa but probably plunged to Earth thousands of years ago. It is composed of six fragments that fit together like a puzzle. The largest of those pieces weighs about 6 pounds (2.7kg). 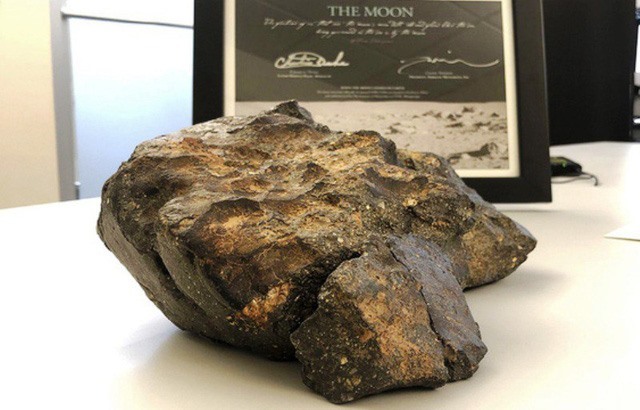 Rober Livingston, RR’s executive vice president, said the moon rocks brought back by astronauts are US government property, so the auction was the only way a private collector could obtain a piece of the moon. Xuân Trường construction company intends to put parts of the meteorite at the feet of Buddha’s statutes at the pagoda while small pieces will be used for carving Buddha statues. The meterorite will be transferred to the pagoda in the next few days. The under-construction Tam Chúc Tourism Site, which is located 50km to the south of Hà Nội, will cover 5,000ha and feature places of worship, a natural lake and a resort. The site is surrounded by a karst mountain landscape with spectacular views that are sometimes considered an inland Hạ Long Bay. The site encapsulates various historical landmarks, such as Thiên Phúc Pagoda, Bà Đanh Pagoda, Lý Thường Kiệt Temple, Thi Pagoda, Lê Chân Temple, Ông Pagoda, Tam Giáo Pagoda and many spectacular caves. According to a plan approved by local authorities, the place of worship will cover 150ha, with a pagoda named Ba Sao planned which will be 150-200m high. From that height, tourists will be able to view a giant bronze Buddhist statue weighing 200 tonnes, as well as karst mountains emerging from the 600ha lake. Other pagodas will also be built on the mountains together with walkways and scenic stops. A nature reserve will also cover 2,400ha of the surrounding area.